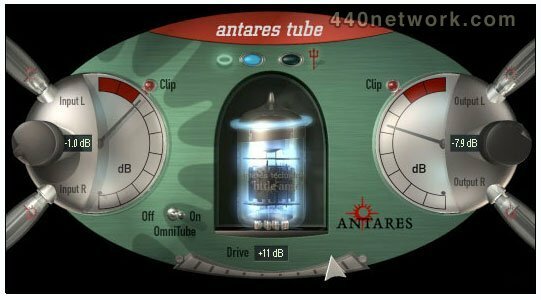 Antares Tube is a multi-format plug-in designed to model a wide range of analog tube effects as well as effects unavailable from any actual hardware. Tube provides two basic tube models. The "heavenly" blue tube adds the warmth of a classic tube preamp to vocals, acoustic guitar, horns, strings, synth pads, in fact pretty much anything. The"devilish" orange tube provides the deep, warm distortion of an overdriven tube amplifier. It can be used in moderation to impart a subtle (or not-so-subtle) effect to almost any track. Or cranked up on electric guitar, bass, synths, even voice for more dramatic distortion effects. In addition to the tube models, Tube includes a unique OmniTube function. 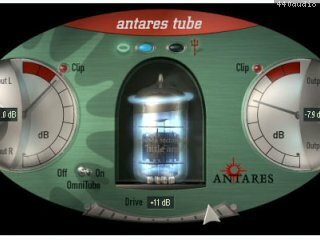 Without OmniTube engaged, Tube functions exactly like a tube preamp, i.e., only the regions of the input signal that exceed the clipping level (typically transients) are affected and all other regions are passed with no change. With OmniTube on, a compressor is inserted into the signal path before the tube model. This compressor is set to compress the signal and then apply sufficient makeup gain to ensure that Tube's Drive control can drive the entire signal above the clipping level. After the tube effect is applied to the entire signal, an inverse gain function restores the signal's original dynamics.